The best holiday gift guide for the foodie in your life. There are gifts for every budget and men and women alike. Stay tuned for more gift guides in the coming week! Today’s gift guide is geared toward the foodie in your life, but I’ve also got a few more gift guides up my sleeve for the coming weeks (heads up, mamas!) Sure, you could wait until Black Friday to scoop up some of these awesome presents, but there are also some great items that could be used as hostess gifts (or just be useful in the kitchen) over the Thanksgiving holiday. 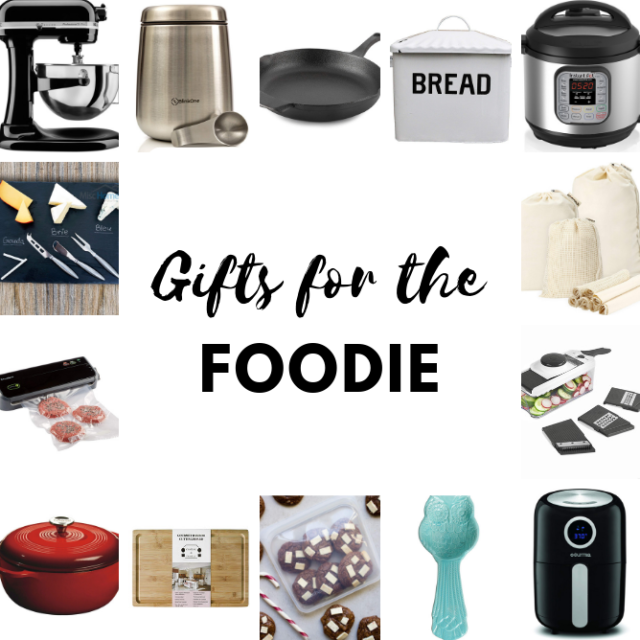 So, without further ado, here is my gift guide for the foodie in your life! I use this professional KitchenAid stand mixer almost on the daily, and now’s a great time to invest in one with all of the great sales going on! Call me a coffee snob, but we wouldn’t be able to live without our fresh ground coffee beans every morning. An airtight coffee canister will make such a difference in keeping your beans as fresh as can be! A cast iron skillet is such an inexpensive yet versatile addition to your kitchen. If you know someone who loves cooking but doesn’t have one of these, get one for them ASAP! Isn’t this just the cutest little bread box you ever did see? I’d love one for my kitchen counter! I finally jumped on the Instant Pot train a few months ago and I’m so glad I did! These things are game-changers, especially for busy families that love home-cooked meals. I’ve been trying to be a lot more conscious about waste these days and I’ve found some great products that have helped me limit the number of plastic bags I’ve been using. These reusable muslin produce bags are the perfect gift for anyone that’s trying to do the same! If mandolines scare you as much as they do me, this multi-purpose mandoline set is the perfect addition to your kitchen. If I had any more room for another kitchen device, you can bet I’d be investing in an air fryer. Healthy frying? Right up my alley! Isn’t this owl spoon rest just the cutest thing you ever did see? The perfect Secret Santa gift! In keeping with my mission to reduce my usage of plastic bags, I recently invested in some of these Stasher bags and can’t wait to grow my collection! Plus, I love that they can go in the microwave, dishwasher, etc. My bamboo cutting board is BASICALLY the only cutting board I use in the kitchen. I couldn’t live without it! The Dutch oven is another kitchen item every foodie needs in his or her kitchen. And there are so many great colors, how can you resist? My BBQ-loving hubby loves this vacuum sealer I got him a couple of years ago. We can buy all the great, big packs of meat at Costco and keep everything nice and sealed up in the freezer. It’s also great for marinating! Finally, who can resist a good cheese board? I love that you can write on this AND that it comes with the appropriate knives. Holiday entertaining at its best! So, what did I miss? Are there any holiday gifts you can’t wait to get for the foodie in your life? Let me know in the comments below!